When you make the decision to sign up for a marathon, you are essentially giving up a large portion of your life for one third of a year. Last year, my first, was hard. Adjusting to running five days a week, up to 22 miles at a time, was rough on my body, but not necessarily on my mind. Last year, I had the luxury of flexibility. I had lost my job just two weeks before my training was set to begin. If it was going to rain in the evening, I could get my miles in in the morning — and not just at the crack of dawn in order to make it into an office at a decent hour. I could do it whenever I felt like it, whenever the weather permitted. This year is a whole new ballgame. I once again have a relatively low-mileage schedule to make it easier on my injury-prone body. But the intense heat of the summer has forced me into 6:00 a.m. workouts or earlier, freeing up my evenings, yes, but leaving me so exhausted that I can do no more than throw together an easy dinner (preferably without an oven or extended stovetop-time) before I feel I can do more than sit on the couch and stare at something — with my legs elevated, of course — and eat ice cream. True to Hoffman form, there are no less than 10 pints of ice cream in my freezer right now. It’s just a thing we Hoffmans do. When Ben & Jerry’s is on sale, you’d better believe my dad buys three or five or eight pints. That in addition to however many are left over from the last sale, or the Häagen-Dazs sale. Though maybe I don’t stock up as often, and with as many, let’s just say I am my father’s daughter. So it should be no surprise that one of my favorite things to make in the summer is this perfect, creamy treat. But forget ice cream. I go gelato. 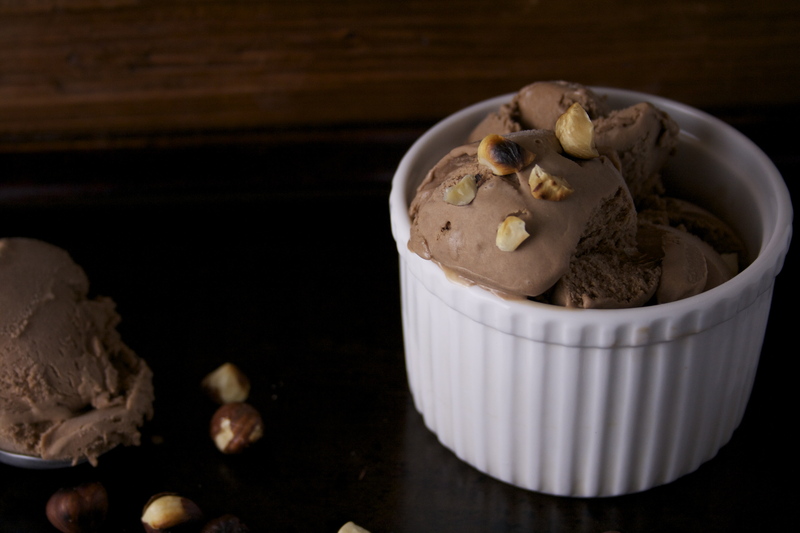 The main difference between gelato and ice cream is the ratio of cream to milk. In ice cream, as you’d expect, there’s more cream. In gelato, the opposite is true. This, believe it or not, yields a denser product. 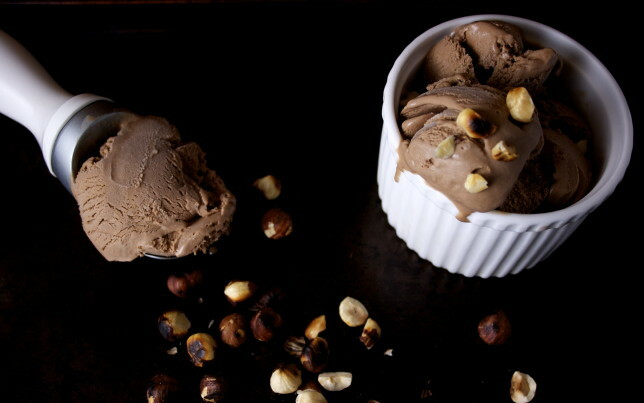 One where the flavors are heightened, rather than tempered by too much fat. It also is traditionally churned at a slower rate, but frankly, my ice cream maker has never had a problem making dense, creamy, silky gelato. And that’s the point: I’d rather eat something dense of texture and flavor than something full of cream and sugar and air. 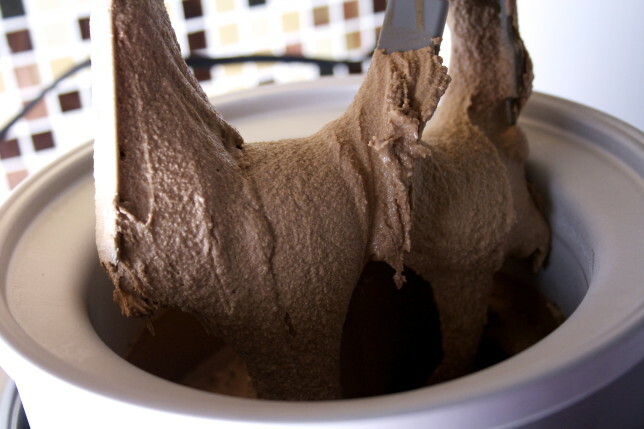 Some gelatos you’ll find in restaurants or cafes try to achieve an intense flavor from too much sugar. 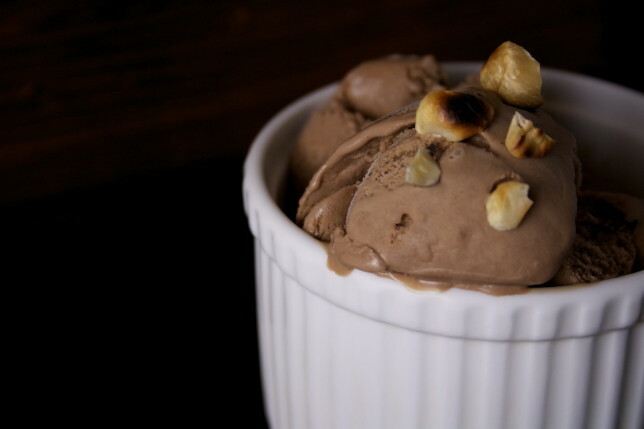 Many store-bought gelatos achieve the silky texture from added ingredients like xanthan gum or guar gum. Okay, fine, shops and companies, do whatcha gotta do. But don’t mind me while I make something a little more authentic, with a little more punch. 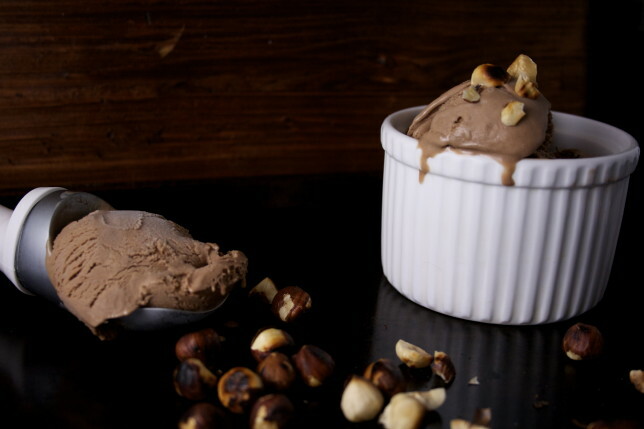 This Nutella gelato — my go-to, not only because it’s exceptional but because we almost always have Nutella on hand, as you’ve probably already surmised — hits the spot. 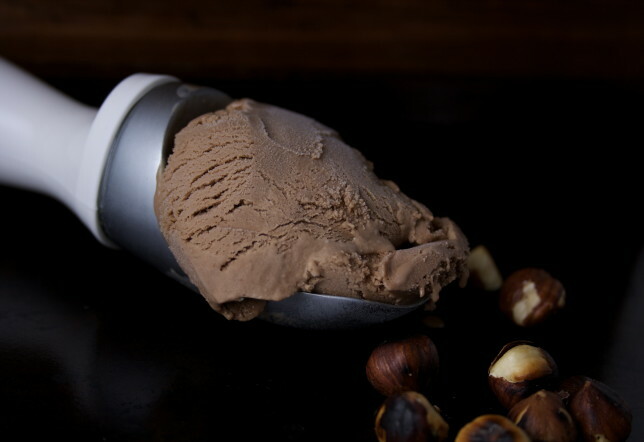 It’s rich and silky and has a deep flavor that’s accentuated with a little extra cocoa, without being overwhelmed by sugar or muted by cream. So don’t mind me while I prop my legs back up against the wall now. I finally found the satisfaction that’s been lacking in all these days avoiding the oven or finding excuses not to make anything that’s nutritionally “necessary.” Sometimes, you deserve a little rest, and a little treat. And if you’re training for a marathon, you deserve a lot of it. Nutella gelato, anyone? Some tips: the custard should be the consistency of creme anglaise when you take it off the stove and put it in the fridge to chill. And make sure you chill it completely — the warmer the base is, the longer it will take for it to freeze while you’re churning. You want to get it done as quickly as possible, so it incorporates as little air as possible and stays nice and dense. I put my storage container in the freezer while the mixture is churning. I’m not sure if it really does much, but every bit helps. Often, when it’s finished churning, it will be more the consistency of soft-serve. For a firmer gelato, put it in the freezer for a couple of hours or more before serving. It’s perfect on its own, in a bowl or cone, but wonderful also with some toasted, chopped hazelnuts. In a heavy saucepan, combine milk, cream, ¼ cup of the sugar, cocoa powder, and vanilla. Heat gently on medium heat, stirring occasionally, until hot. Meanwhile, whisk together egg yolks and the remaining ¼ cup sugar in a medium bowl until thick and lightened in color. Whisk in about ½ cup of the milk mixture to temper the egg yolks, and then pour this mixture back into the saucepan. Heat on low heat, stirring constantly, until thickened, about 7 to 10 minutes. When the custard is thick enough to coat the back of a spoon, pour through a fine-mesh strainer into a large bowl. Whisk in Nutella until completely dissolved. Place plastic wrap directly over the surface and chill in the refrigerator overnight, or until completely cold, and then churn according to your ice cream maker’s instructions. 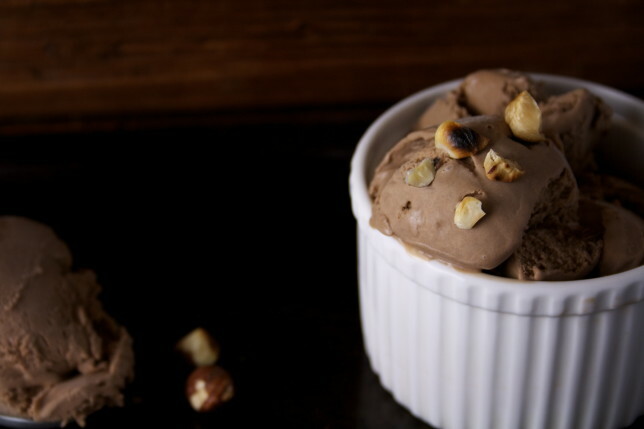 Enjoy right away or, for a firmer texture, place your gelato back in the refrigerator (in a sealed container) for an hour or more.